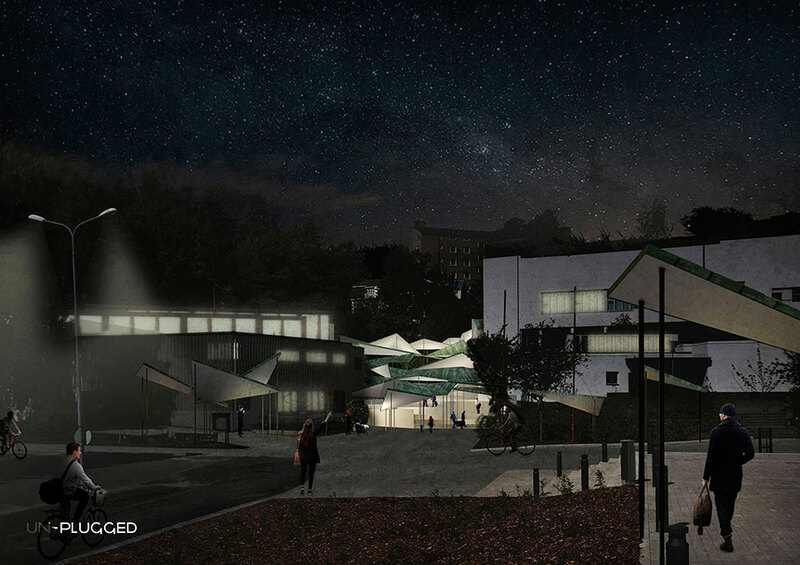 We understand this competition as an opportunity for the city of Jyväskylä to promote the success of their late urban development by plugging the different university spaces. At the same time , we propose a re-understanding of the functioning of the museums in the XXI century, with a more flexible and multi-functional use. The transformation of the Seminaarinkatu street into a pedestrian alley , connecting the new square with the city center, will create a new centrality area at the city level as well as at the university level . 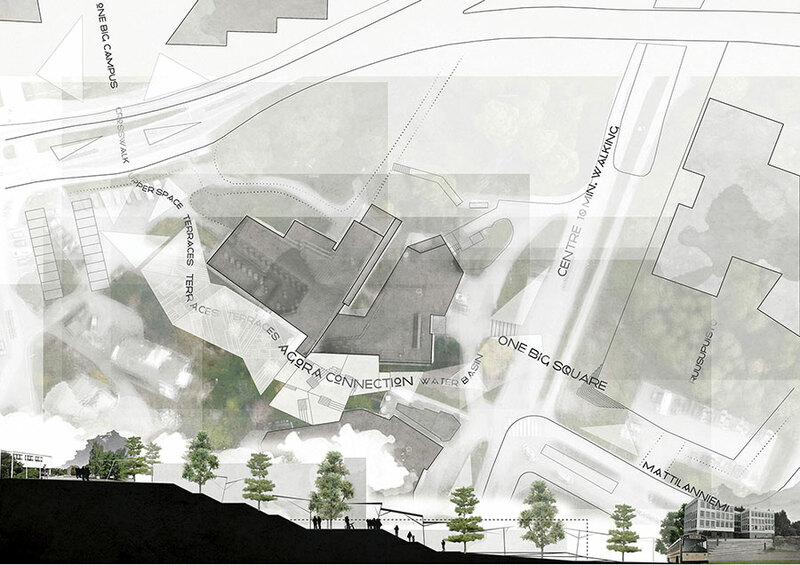 We propose a new connection across the very steep topography to resolve the movement along the upper campus and the new square. This will be done through a landscape terrace stepping in between the two museums arriving to the square level, improving the centrality of this urban space. Museum cannot be a close archive. They need to be more open and flexible to interact with the city. We understand the museum and the connection as a system of 6 smaller autonomous pieces: The two exhibition spaces , the library , the auditorium , the cafe , and the Shop. Each one of these pieces can work independently, with its own access to the square, activating it. 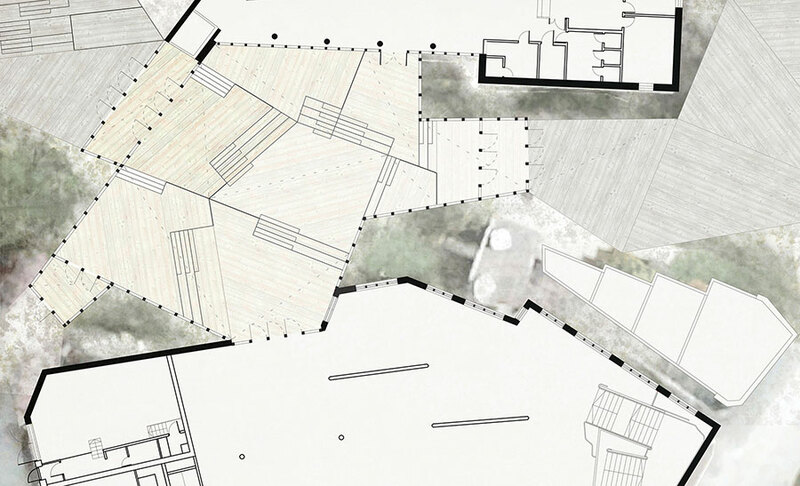 In this context , the new extension is understood as covered urban space, an interior extension of the existing square , in which people can gather , shop and walk through their destination freely. An agora like space in the center of the cultural life of Jyväskylä . The stand that start in the upper campus found their maximum expression in the interior space: The agora like formation that allows to overcome the gradient difference in between the two buildings , the square and the way to the upper campus.